Limited Time Offer! Book by May 9th! Contact us for a personalized email quote. †Kid’s rate based on travel with full paying adult and offered on select departures only; kids must pay air and taxes and fees as listed below; qualifying ages and maximum number of kids vary by resort. ††Restrictions apply. See website for details. *Advertised prices available for bookings made electronically through your travel agent. Prices are per person, based on double occupancy. 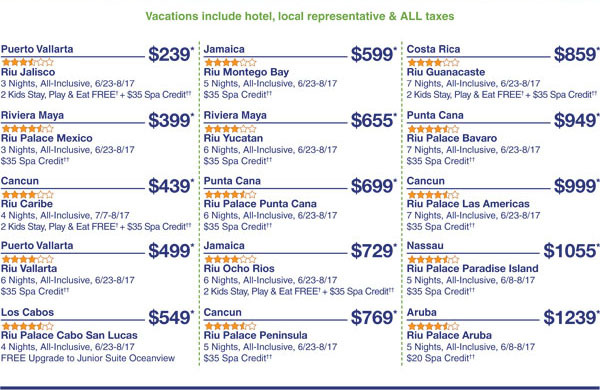 For full terms and conditions, hotel and description of all services, please refer to the Vacation Express 2012 brochure. Some upgrades are subject to availability upon check-in. Packages at the above prices are limited and are subject to change without prior notice. Not responsible for errors or omissions. See Participant Agreement for details. Registered Florida seller of travel no. ST38441. State of California Seller of Travel Certificate of Registration #2107538-40.